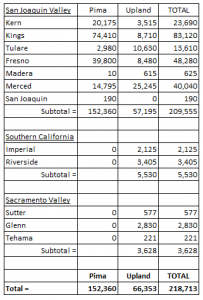 The Pink Bollworm Program under the California Department of Food and Agriculture has released their final mapped numbers for 2016. While the drought is not over, for the first time in six years, cotton acreage has increased. 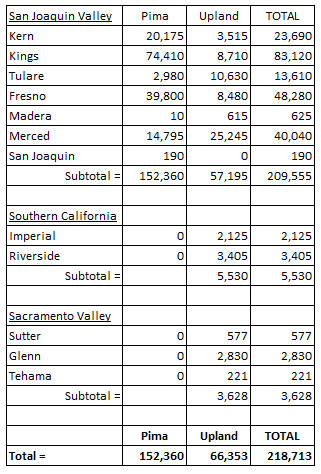 Final acreage numbers for California put Pima at 152,630 acres and upland at 66,353 acres for a total of 218,713 acres statewide. This represents a 31% increase in Pima acreage and a 44% increase in upland acreage as compared to 2015. This represents a 35% increase in overall cotton acreage for 2016. This entry was posted in NEWS & ISSUES on August 16, 2016 by ccgga.